The husband loves something sweet for breakfast and muffins and pancakes are his favourites. This is a tricky situation as it means filling up on loads of carbohydrates to start the day. Though we need carbs to wake up the system and to stay active during the work hours, the sweet kind of breakfast could lead to mid morning hunger pangs and sweet cravings later. Yes, Insulin discipline is very important. The only good thing is that he likes his sweet eats really lightly sweetened, so much so that I always make the pancakes plain (without sugar) and drizzle honey or some fruit preserve over it and he loves it this way. 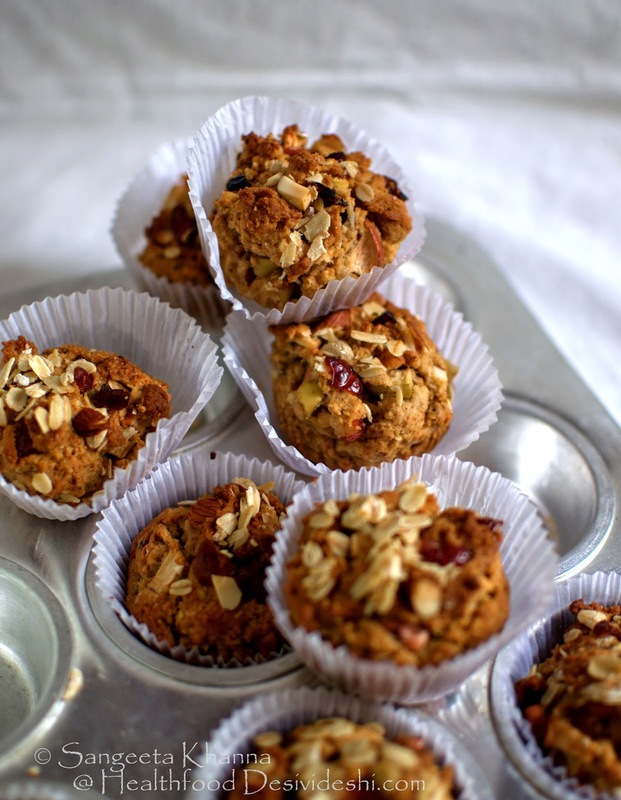 But for such granola muffins, I add a little jaggery, natural unsulfured brown sugar or honey or a mix of all these to make the muffins lightly sweetened. He likes all the alternative flours that we eat every single day, actually I am yet to see a guest or friend who did not like the food cooked with alternative grains at our place. That strengthens my belief in real ingredients tasting better than reconstituted mixes and flavorings. 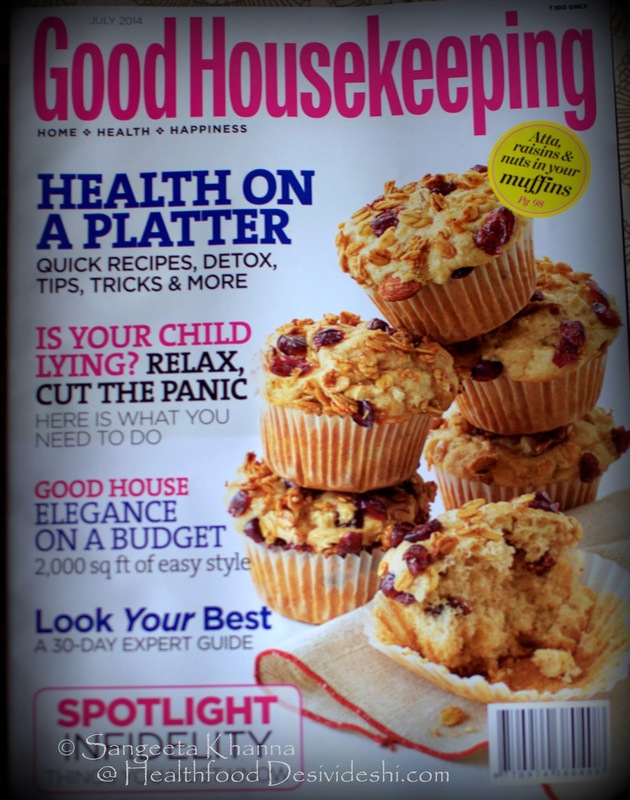 This granola muffin recipe was featured on Good Housekeeping India's cover page (July issue) and uses all Indian ingredients, dehydrated cranberries and rolled oats are also available now a days but you can skip adding them if you don't have. Normal oatmeal (Quaker, Saffola or Baggry's) works well in this recipe. Use raisins, dry black grapes, chopped dates, figs or candied ginger for variation in taste and texture. Also, I must add that the same batter can be used to make pancakes too, a little easier in an Indian household where the oven is used occasionally and a griddle is on the stove almost every meal time. So if you are comfortable with your griddle just go ahead, thin the batter a little and make some pancakes with the same batter. I used 2 types of apples for this batch as I always want the apple flavour to take center stage. One tart green apple and one sweet red apple from the hills at Dhanachuli. I have been going there for work almost every 4th week and love to bring back seasonal fruit from there. Mix the flours (saving 1 tbsp rolled oats for sprinkling on top of the muffins), cinnamon powder, baking powder and baking soda and keep aside. Mix the egg (or yogurt) with butter, honey, sugar and vanilla extract and whip well. Mix the wet mixture and dry flour mixture together and fold well. 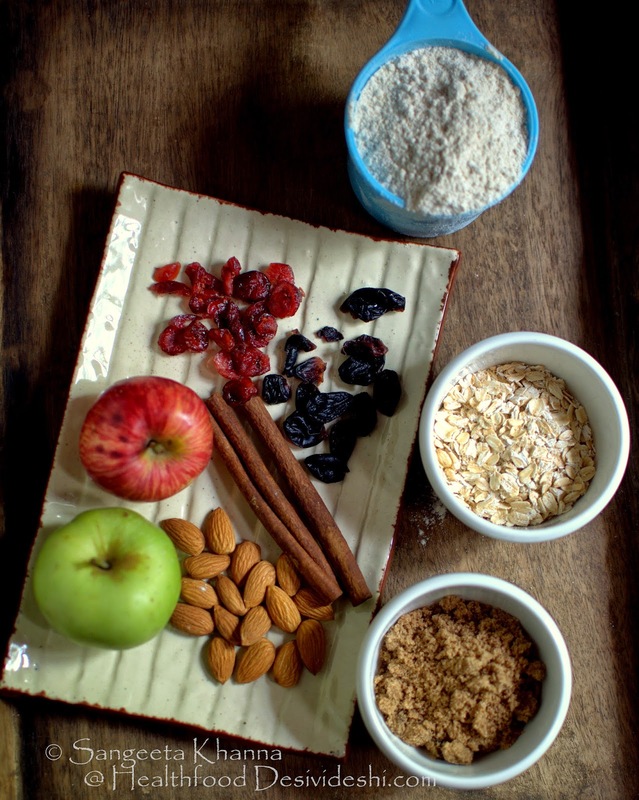 Add the chopped nuts, dried fruits and chopped apples and fold in everything nicely. The batter will be thick and not flowing consistency. You can add a little milk to make the batter a bit loose. Divide the batter into nine muffin liners placed in a muffin tray. **Whole grain or multigrain muffins respond to thick batter well I feel. In this batch I made balls of this loose batter with my hands and filled in the muffin liners, there is enough fresh fruit to keep the muffins soft and moist. Bake the muffins at 180 C for about 20 minutes. Check by piercing with a skewer, bake a little more if required. 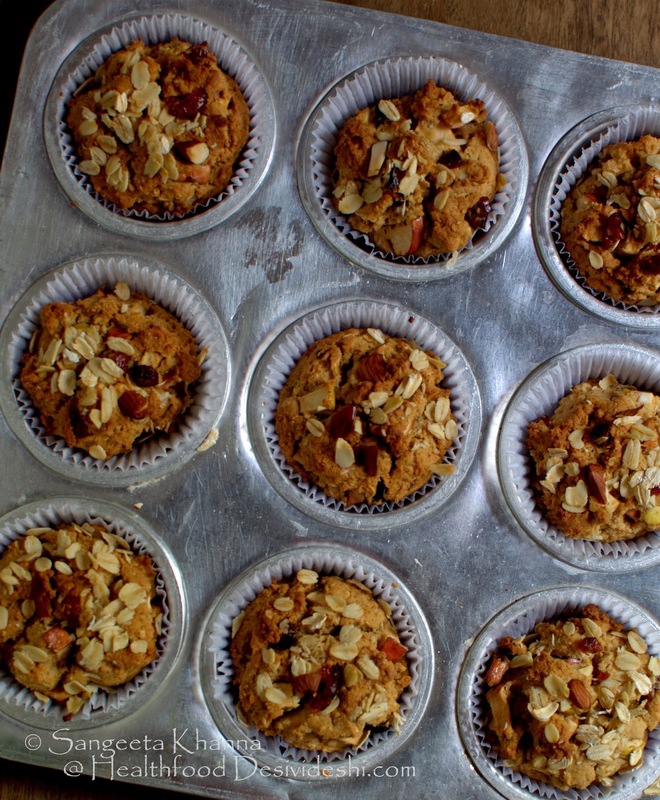 The muffins don't rise much as the apple pieces shrink while they cook and the batter occupies the space as it expands. The muffins are quite soft and spongy nevertheless. I have had small kids who don't eat cakes and have loved this muffin. The taste comes from real ingredients and not refined, reconstituted and artificially flavoured stuff. I reiterate. 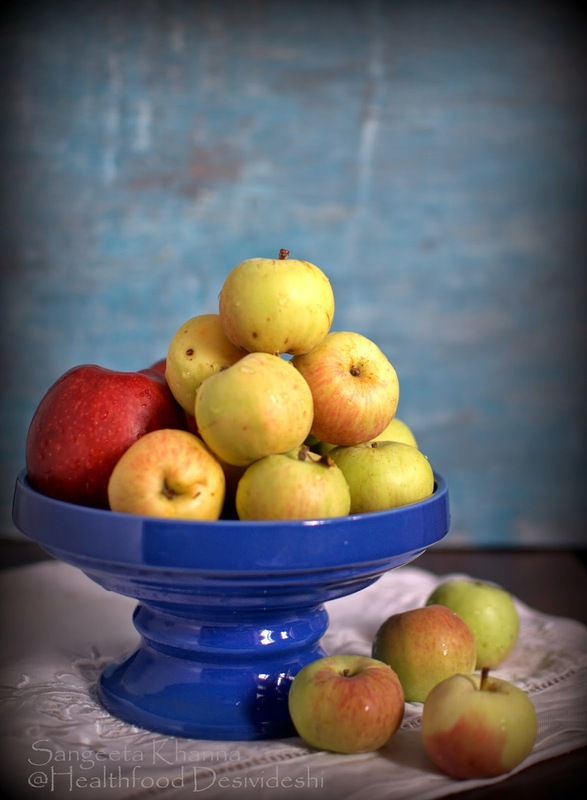 Apples are great by themselves, we use them to flavour the cooked food as and when required. 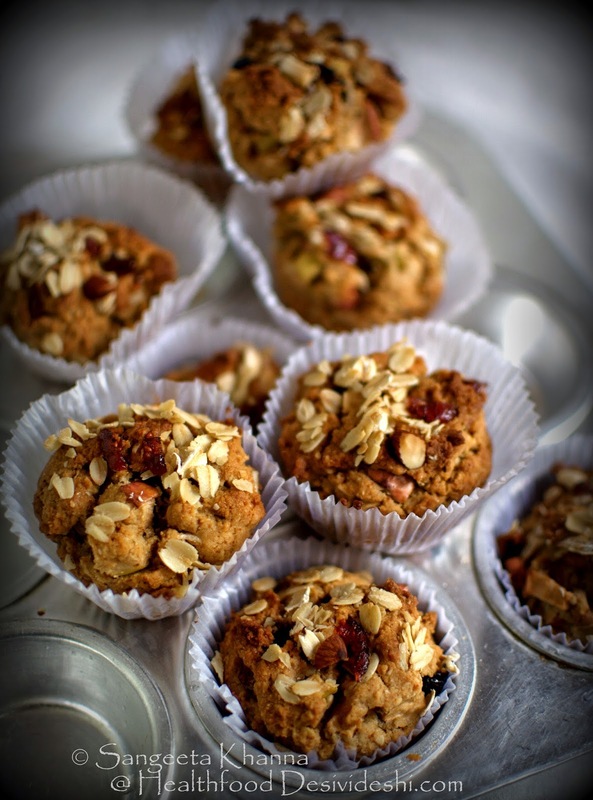 And it does add value to these yummy granola muffins with chopped apples. Out of the 8 recipes of mine that were published as a cover story in the July issue of Good Housekeeping India, this one was the most demanded on the blog. 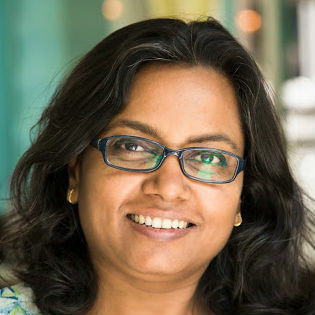 Many people live outside the country or in small towns of India where the magazine is not easily available and they wanted to try the cover page recipe. I hope many of you will be baking this for your family and would realise how healthy ingredients result in great taste. 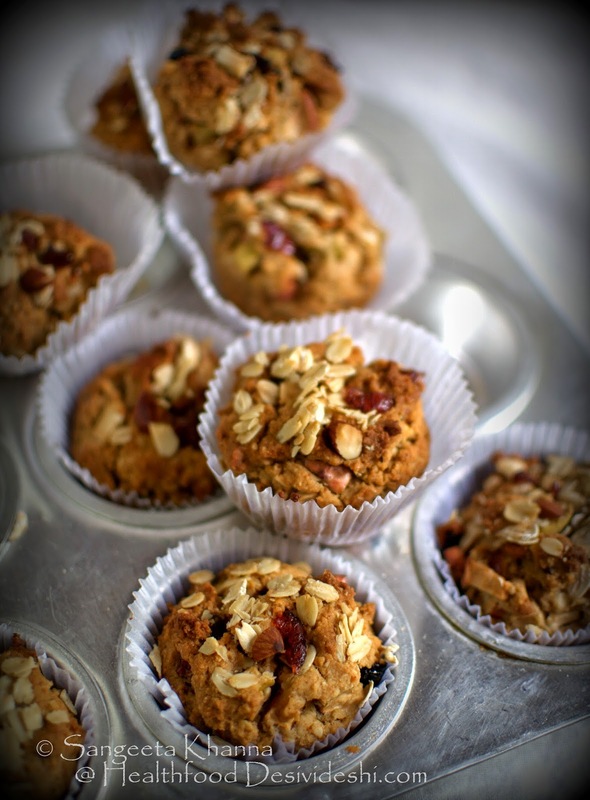 Please let me know if you try these apple granola muffins. One or two muffins and a glass of milk is great for a hearty breakfast. Save some batter to make quick pancakes if you like. I would love to hear about your take on the recipe. Congrats on the great feature, and the lovely coverage. Love that this is REAL food, from the heart. Must make some soon... nom nom nom. Wow, this looks great and many congratulations on the awesome cover and getting featured. I will surely attempt this receipe. Please let me know what are rolled oats? does this mean these are oats in flour form. My son loves muffins and I am hoping this will be a healthy alternative. please powder the rolled oats to replace oatmeal in the recipe. It is difficult to find organic atta in my town. Is there an alternative that I can use? Maybe a combination of flours? My chapatti do not turn out right with regular (American hard red wheat) flour. Sorry, I know this post is about muffins. Try kneading the dough with ht water and see how it works. Or knead the atta using some cooked oatmeal slurry.